At Your Premier Life Coaching, we understand that your work and your life are not two separate things. When something affects one, it affects the other. As part of The Modern Observer Group, Your Premier Life coaches have access to skill sets that most coaches can’t touch. We understand how to help your career and your business, as well as being able to help you create habits that allow you to enjoy your life. Our coaches work with you in group sessions and one-on-one to address all aspects of your life including your job, your family, your friends. To achieve your premier life, you can’t leave any part of it behind. We’ll help you craft your whole life into the life you have always wanted to live. To reach their peak performance professional athletes all have coaches. The same applies to you. Our coaches work with you to identify what is holding you back, give you a fresh perspective on your situation, work with you to formulate a strategy for success, and help you implement it. That last part is critical. We are not going to tell you that the universe will provide for you. We will help you take concrete steps to define and achieve your goals. This is not cheerleading or new age mantras. We will help you get things done. 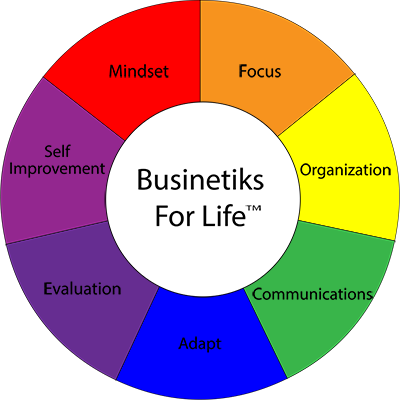 Your Premier Life Coaching is based on our proprietary Businetiks For Life™ system. This holistic approach was created on the idea that every action has consequences, not just to the project but to the person. Our holistic approach anticipates and helps our clients through both the difficulties that any plan may encounter and the unintended consequences that can follow.